It was raining as we arrived at Hunting Brook; a light, steady drizzle filtering through opaque air. The lanes leading to the garden were bounded by sullen brambles and parched grasses, begging for relief from the heat and drought. Inside, thalictrums and fennels were spangled with water droplets, bowing gently beneath the unfamiliar weight. Rain in Ireland is not unexpected, but this summer it has been rare indeed. The shower, if you can call it that, lasted a couple of hours before dissolving into heavy humidity. The first impression one gets of Hunting Brook is that this is a humble, country garden. 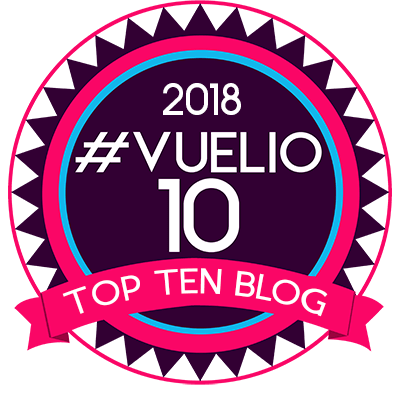 There are no fancy gates or swanky signs, no tea room or entrance kiosk; just a small gravelled car park, a few handwritten chalkboards and a box to put your entry fee in. These uncomplicated arrangements remind me of many private gardens I have visited in Cornwall and are just how I like them; the garden should always be the main event. In a glade surrounding a small, chalet-style building unfolds an extraordinary garden. It is the creation of a remarkable plantsman, Jimi Blake, a man who carries his genius with endearing lightness. I have written before about the difference between good gardens and great ones. Great gardens possess a series of qualities, some relatively easy to attain with hard work, talent and money. However atmosphere is a quality that requires both a sense of place and a gardener with imagination, vision and genuine understanding of what the land can achieve. To create atmosphere takes time and constant reappraisal. Hunting Brook has it in spades. 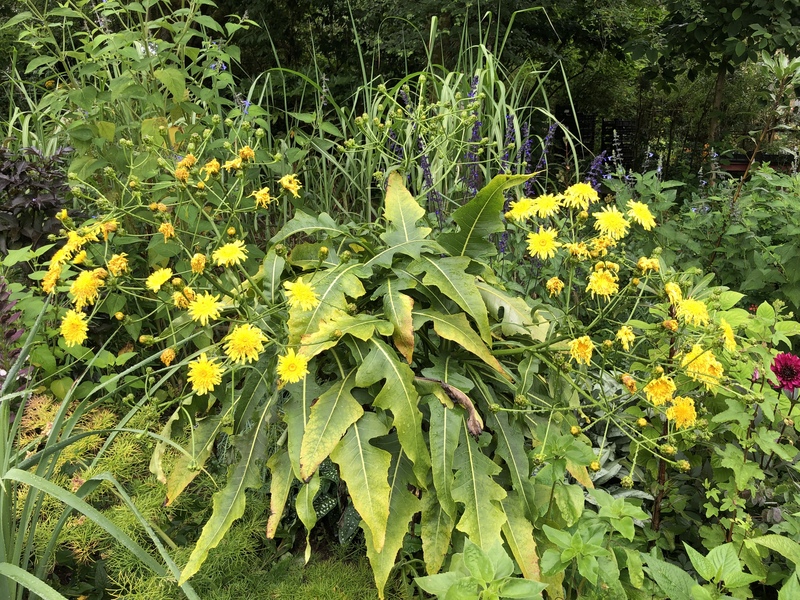 I was immediately struck by a pervading sense of the primeval, at first suggested by a wonderful patch of Celmisia semicordata ‘David Shackleton’, a native of New Zealand, and then by a sweeping bank planted with Aralia echinocaulis raised from seed collected in China. Everywhere one looks there are plants which challenge the eye and the brain, conjuring up images of Jurassic forests and testing the identification skills of all but the most knowledgeable plant collector. Cryptomeria japonica ‘Araucaroides’ points its scaly green fingers towards you, as if it were saying ‘you there! Bet you don’t know what I am?’. To suggest this is a merely a garden of curiosities would be quite wrong. Hunting Brook is a plantsman’s garden in every way, home to one of Ireland’s finest private botanical collections. It is also a highly experimental place. Jimi throws most gardening conventions to the wind, which is something only an experienced gardener can do. This confidence and adventurousness is what makes Hunting Brook so special. Everywhere one looks there’s an unexpected pairing, an unidentifiable plant, a coming together of colours that ought not to work, but yet they do. It’s a horticultural melting pot of ideas, and good ones at that. It is also beautiful, intriguing and romantic. 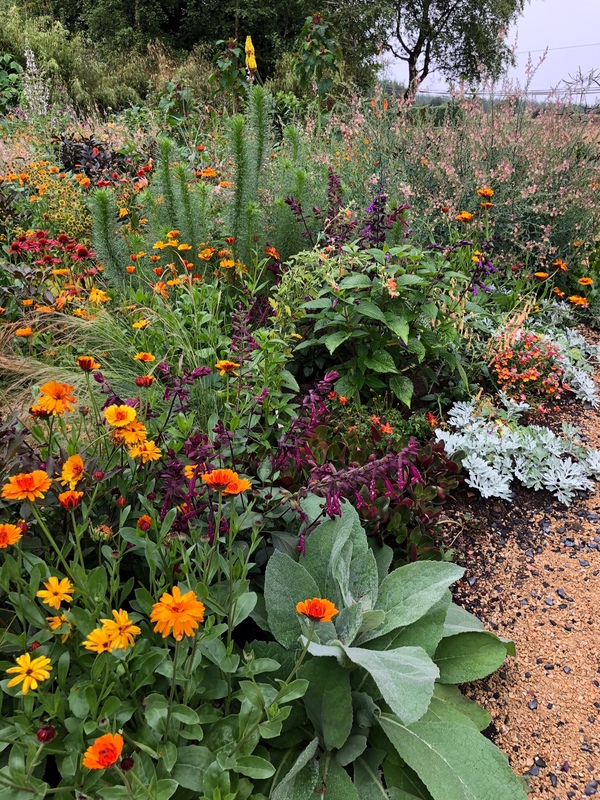 Jimi gives himself space to develop his planting ideas, building their theatricality and richness through a constant process of addition and subtraction. If Hunting Brook were an ecosystem, it would be one of the most diverse on the planet. I could attempt to describe Jimi’s planting schemes but I would not do them justice. I was so intent on listening to his gentle musings that I had little inclination to stop and take notes or photographs. Perhaps I shall regret this, but somehow I think not. Sometimes it’s better to be in the moment. At the very least I should provide you with some kind of overview. Hunting Brook covers around 20 acres, 5 of which are garden, with the remainder being mature woodland or meadow. Near the entrance there are two gently sloping banks on either side of a gravel driveway. 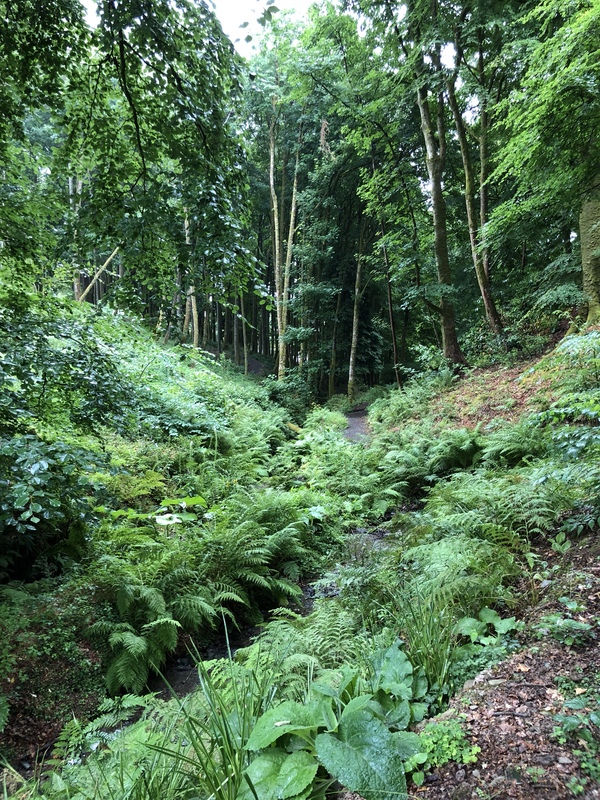 The shadier bank is dominated by the aforementioned aralias, underplanted with bamboos, ferns, ligularias, rheums, hardy geraniums, astrantias, astelias and alstroemerias, to name but a few. The opposite, sunny bank runs right up to the boundary hedge and is thickly planted with sun-loving plants from the common-or-garden calendula to not so common Aeonium hierrense. It’s a heady mix. Again, too many exciting plants to name them all. 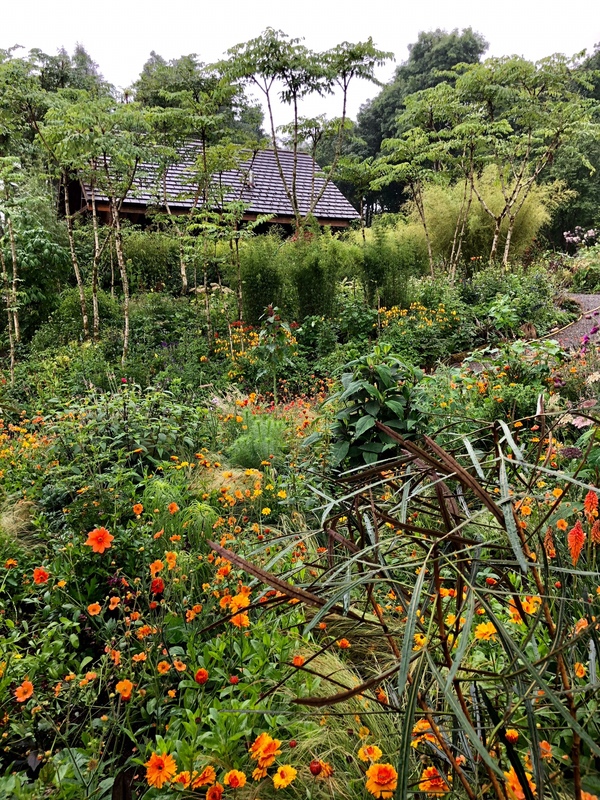 In the same bed you’ll discover Pseudopanax ‘Chainsaw’ (there are panaxes everywhere you look at Hunting Brook), Salvia lutea ‘Kirstenbosch’ and Musschia wollastonii alongside echinaceas, dahlias, salvias and linarias. Jimi is constantly adjusting the planting to achieve balance, different effects and to accommodate new plants. We quickly established that we shared a weakness for anything quirky or unusual. The colour scheme in this border is predominantly green, orange, apricot and smoky bronze, punctuated by flashes of white and silver. Behind the house lies Ashley’s garden, created on the site of a former carpark. 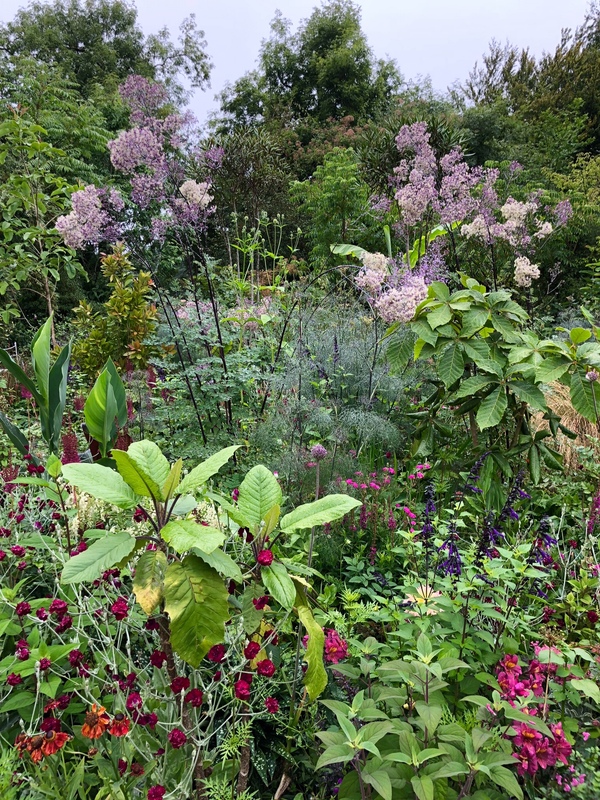 Again, this is a magical meeting of the familiar and unfamiliar, a freestyle swathe of planting where familiar phlox, sinister-looking Pseudopanax crassifolius and lush Musa ‘Tiger Stripes’ rub along as happily as can be. As the sun finally beats the rain into submission the rich magentas, purples, pinks and reds in this garden come alive, softened by a million water droplets. A sheltered space at the back of Jimi’s house is known as the Garden Room, a small, gravelled rectangle bounded by some of the most exotic and exciting plants in the garden. My mind is so stuffed full of plant names by this stage that I fail to absorb most of what I’m told. Close by, Jimi is waiting for a large number of dahlias to bloom, all grown from seed collected in South and Central America. Both Jimi and his sister June are fans of these tall, single-flowered dahlias which are so much easier to combine with other plants than their fancier cousins. The woodland garden is another world altogether and quite unexpected after the bright expanse of Ashley’s Garden. Here the narrow Hunting Brook, after which the garden is named, carves a deep valley, further accentuated by towering beech trees. 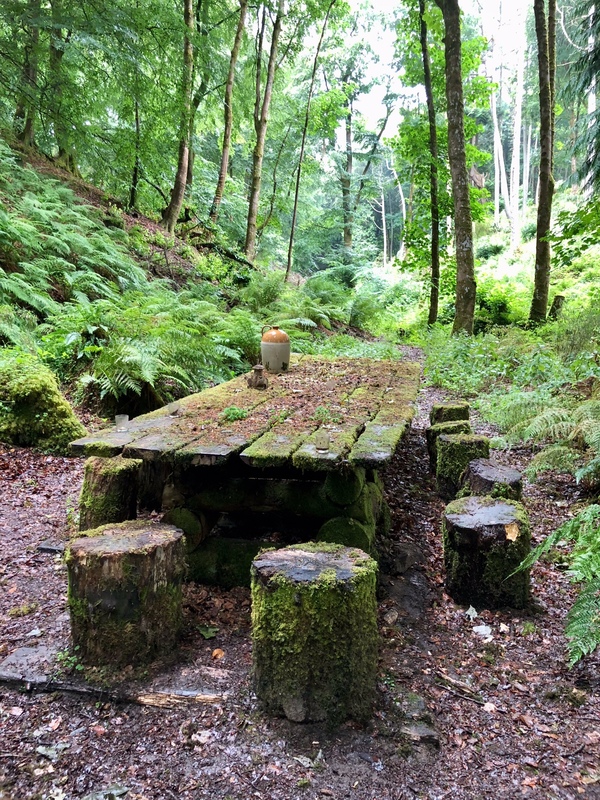 Jimi has cleared an almighty glade in the centre of the wood allowing light to fall on an extensive collection of Scheffleras, large-leaved magnolias and other woody plants, many grown from wild-collected seed. We stop to discuss a gigantic and dangerous-looking thistle grown from seed collected in Tibet. Every plant seems to have a story attached to it. In another 10-20 years one can imagine this will begin to rival the likes of Heligan’s Jungle Garden, only it will have a Jimi Blake twist. 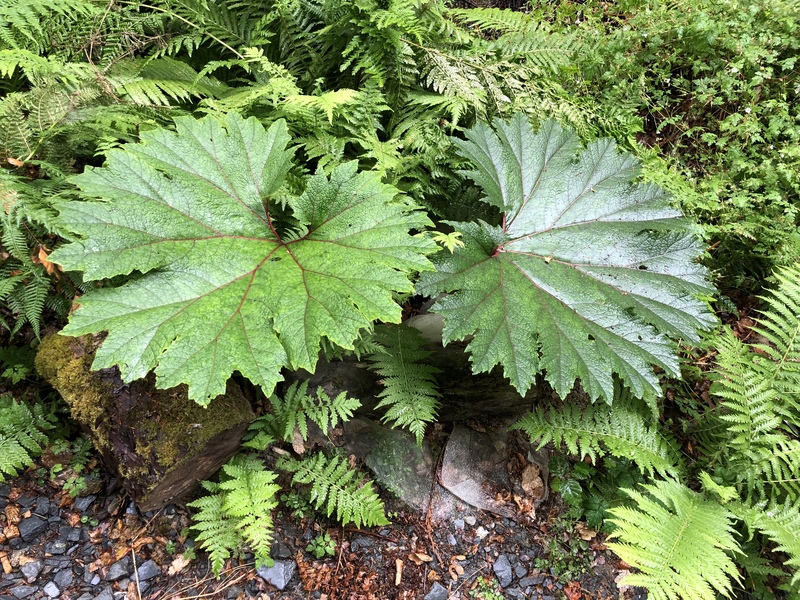 The valley is not over cultivated, with just a few choice, large-leaved plants such as Gunnera killipiana, Zantedeschia ‘Hercules’, rheum and rogersia used to enhance the natural vegetation. Emerging on the other side of the valley we emerge in a sloping 4-acre meadow with views across the fields to the Wicklow Mountains. A serpentine path is mown through the long grasses where soon butterfly orchids will bloom. A circular route takes us past a Bronze Age standing stone, a reminder of Hunting Brook’s ancient past, and then back through the valley to Jimi’s house. Here we stop for tea and biscuits and talk about people, plants and books. My kind of conversation. Jimi Blake strikes me as a restless, generous and kindly man, quite unlike anyone I’ve met before. He is calm, yet energetic and easy to get along with. 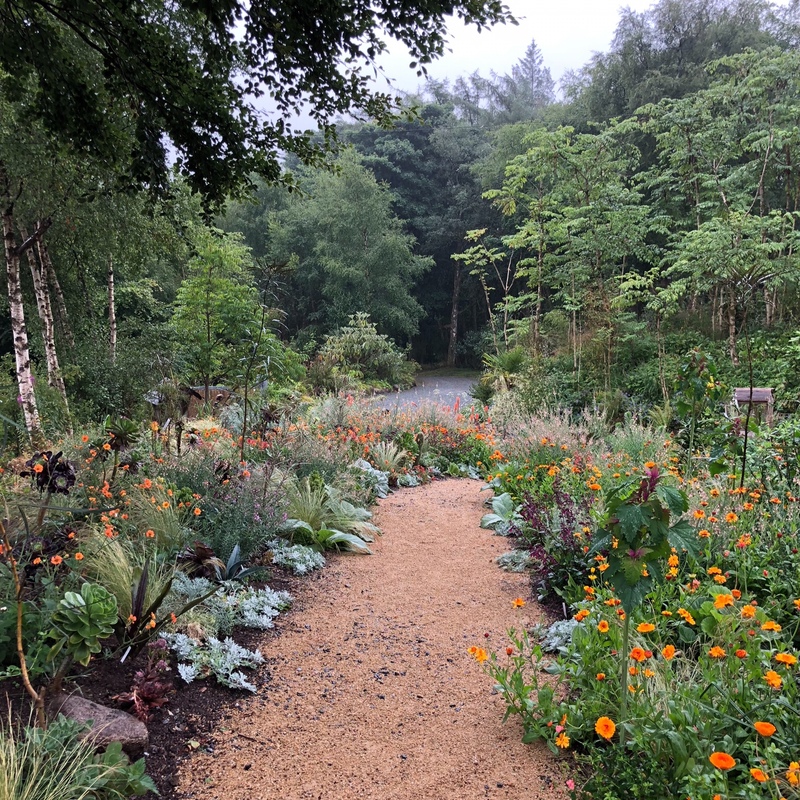 For me this visit to Hunting Brook was one of those special moments which has made me think long and hard about how I want to live and garden in future. It’s given me confidence in my efforts whilst spurring me on to try new things. On that basis we should all visit Hunting Brook at least once, notebook in hand, mind open to the infinite possibilities of gardening. TFG. Jimi will be walking and talking with Monty Don at Longmeadow during this Friday’s edition of Gardeners’ World. Tune in to BBC2 at 8pm. With special thanks to the wonderful Carol Marks for being my guide and companion, and for the best introduction to Irish gardens one could wish for. Calendula ‘Indian Prince’ – a favourite annual of Jimi’s, used extensively on the sunny bank. Salvia argentea – a biennial or short-lived perennial with distinctive, felted, silver-grey leaves. Linaria ‘Peachy’ – a lovely, frothy perennial with pale peach flowers and grey-green foliage. Dahlia ‘Night Butterfly’ – an operatic collarette dahlia. Velvet-red outer petals surrounding a ruff of smaller white and magenta florets. Loved by bees. 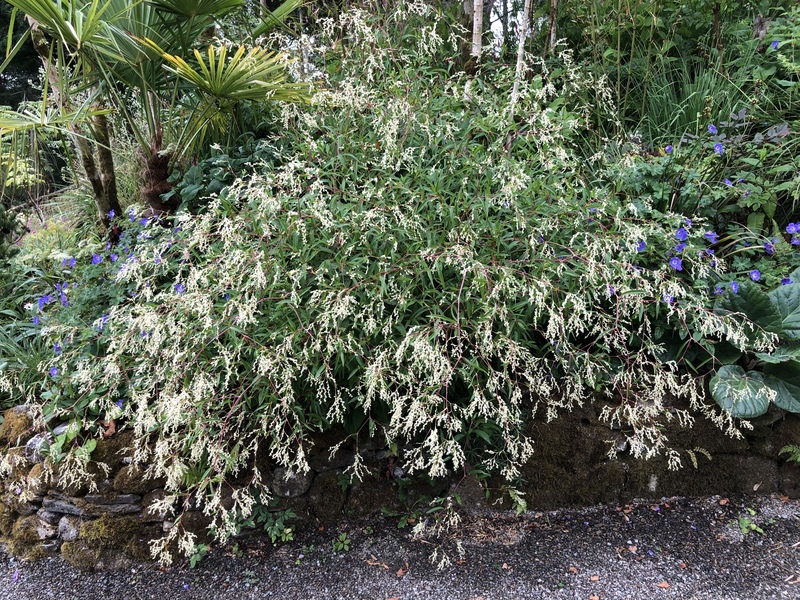 Senecio christobalensis – one of two plants that came home in my hand luggage. Carries olive-green leaves the size of a dinner plate on furry red stems. 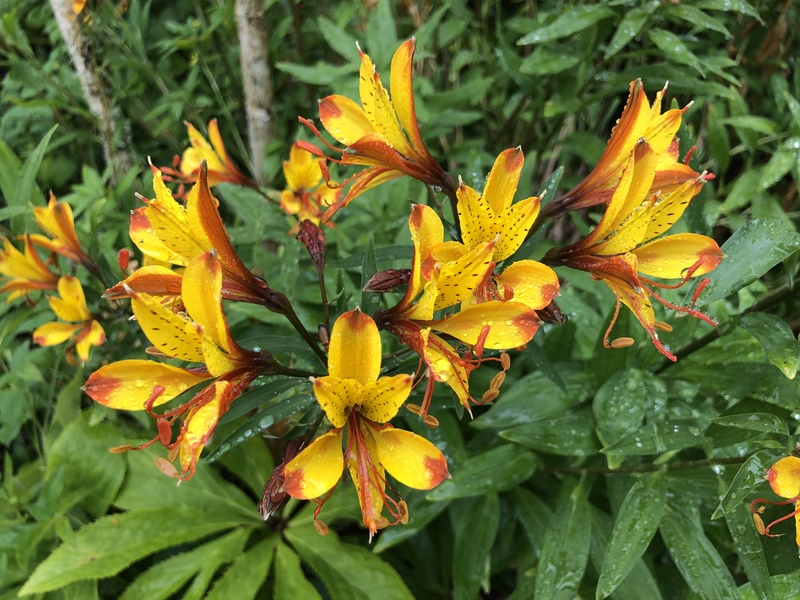 Alstroemeria ‘Orange Glory’ – a strong grower with deep orange petals adorned with purple markings at their tips. Tagetes patula – not the dumpy, bedding marigold, but a tall plant with flowers the colour of burnished bronze. Thalictrum ‘Elin’ – A giant of a thalictrum producing clouds of pink blossom that reach for the sky on stems up to 10ft tall. Salvia patens ‘Guanajuato’ – a tuber-forming salvia with royal blue flowers and dark markings on the rough leaves. Drool-inducingly good with yellow dahlias. Aeonium ‘Voodoo’ – somewhat similar to ‘Zwartkop’, which is the variety I grow at The Watch House. Blissfully easy to propagate. 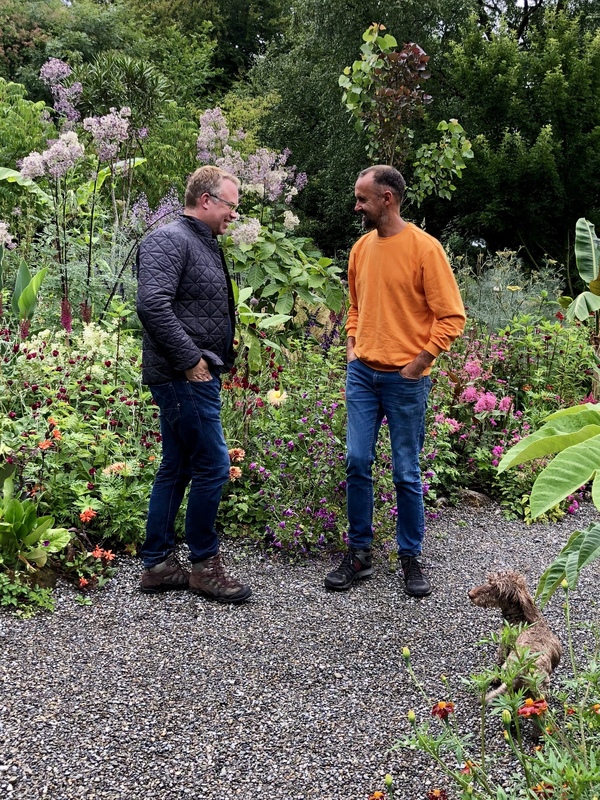 What a delightful article and good photos of this garden in Ireland. Thanks Dan. My pleasure as always Rodja. Not my style at all as it just seems messy to me. I prefer the English gardens, cottage gardens, French herb parterres, and of course charming courtyard container gardens. Those are the gardens I write about. What a stunning plant that new-to-me Thalictrum Elon is. A quick research tells me it would be most unsuitable for our conditions, so I’ll have to admire it from afar. Hunting Brook garden is just splendid. Thanks for the tour, Dan. I grow elin and a few other thalictrum’s and theyre surprisingly tough plants and have been ok in sunny positions with no special treatment, so are definitely worth trying. I got elin from botany plants, also cgf do one with very blue leaves which is my favourite. thalictrum glaucum works well right at the front of a boarder and i imagine would fit the look in a gravel garden planting. 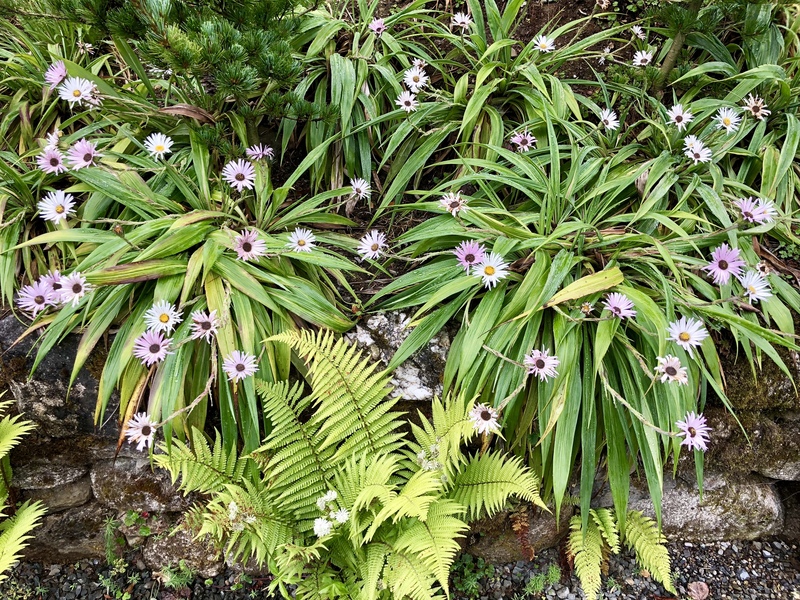 One thing i have found is that planting combinations can be a bit difficult for some thalictrums as some/most of them (elin being one of the exceptions) have all the leaves at the base and just send up the flower stalk, so cant usually be seen that much in the middle of a border. ive noticed thatoften this sort also tend to die back after the spring flowering and leave a gap until the new leaves come up again. 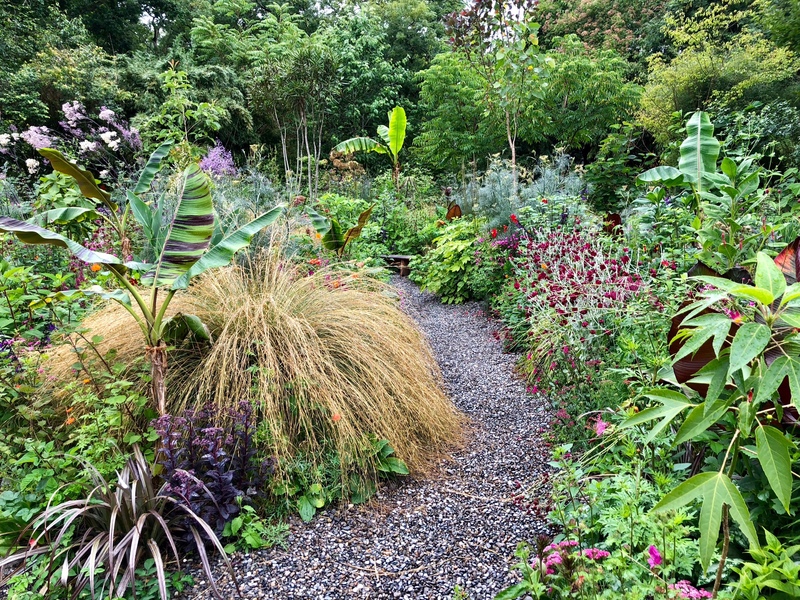 some planting combos ive tried and worked are having the blue leaved types next to and just behind silver astelia’s, thalictrum glaucum next to Euphorbia and stipa arundinacea and i imagine elin would also look good infront of fergesia bamboos in partial shade. Yes, that’s what I miss: scale. I can only repeat things a few times in my tiny garden. Jimi showed me the tent where he intended to camp out, but apparently he tried it one night and gave up half way through. I’d have done the same. I am not a camper!! Wow! Exceptional post about an amazing garden. “Connecting with the land”, as Jimi says in the video, may be the most important point of all, especially in this time of climate change. He emphasizes that even on a tiny piece of land, one is still gardening on the Earth. Beautiful! Thank you, Dan. Yes, that’s a very pertinent point to pick out. The Earth is doing all sorts of odd things to us gardeners this year so we need to keep close to the ground!! I am always open to visit a new garden so thank you for the opportunity Dan. Lots of very unusual and interesting plants. And a fascinating plantsman it seems. He is indeed! Worth making the pilgrimage. What a fabulous garden and I love the moss covered bench and stools. I know Nicky. Not a feature that can be achieved overnight, nor in the part of England where I live. However, when I get my Cornish garden I will be well away! Lucky you! I hear the Plantsman’s course is brilliant, but I imagine anything Jimi does is brilliant. The course is through the gardensmasterclasses. Incredibly well priced, and the flight to Ireland is so reasonable. A treat for any gardener ! I visited Hunting Brook last month and was enchanted. Thanks for the reminders!